60 years ago, the nations of Earth fled the deteriorating planet to form colonies in space. To settle disputes, they created a war based on the principles of good sportsmanship! Known as the Gundam Fight Tournament, each nation sends a representative and their Gundam to Earth for a Tournament, with the winners nation granted the privlege of ruling space for four years! Now, as the 13th Gundam Fight Tournament commences, Neo Japan's Domon Kasshu has come down with his Shining Gundam and an ulterior motive: find his brother Kyoji, who hijacked his father's Ultimate Gundam and fled to Earth with the intention of destroying the planet! 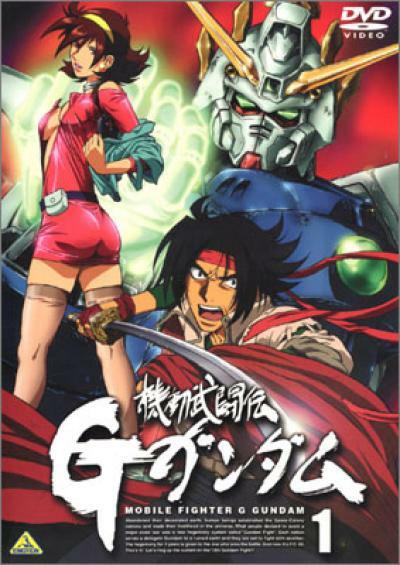 His mother dead and his father sentenced to a cryogenic sleep, Domon's only hope to restore his family is to kill his own brother and destroy the Gundam, but can Domon find it in his heart to kill someone he loved for so long? Kidou Butoden G-Gundam I remember watching episodes of several Gundam titles on and off back when Toonami was still airing on Cartoon Network yet the one that I did watch a majority of was G Gundam. Back then, I was glued on seeing what I could of the series while I was in high school thanks to the sight of seeing giant robots fight one another in a world tournament. But after having seen the show years later, the show hasn't really aged too well for me. Pretty much, the entire show has the feel of a shounen action anime where the plot is mostly a backdrop for mecha fights piloted by martial artists who regularly train for the sake of getting stronger and getting deep into self-doubt when up against a stronger foe where without anyone around to knock sense into them, said character would be too dense to know what to do, thus Character Induced Stupidity sets in. Characters brag about their "super special ultra secret" techniques, evil characters have the annoying habit to laugh evilly at their deeds and have little depth, the series has enough of a habit overemphasizing the importance of fights and all the other standard formulas of shounen. The major problem with sticking to these formulas is that potential areas of plot exploration such as the development of Rain and Domon's bond and the tensions between Master Asia and Domon are put to the back-burner just to show off the fights and when the show finally decides to focus on them, the handling of the plots didn't hook me in thanks to the heavy focus on fights. On the visual end, G Gundam is tolerable at points (good looking mecha designs and decent scenery) yet just awful in others (animation's poor, a number of reused animation frames, character designs are often off). There are a couple positives that did keep me somewhat interested. A few of the side characters in the show did well at contributing some comedy such as the monks that accompany Sai Saici and George De Sand's butler. I even got some laughs at the expense of some silly looking mecha designs such as a couple Gundams shaped like a windmill and a bull. An episode focused on Sai Saici having his first romantic interest was the best episode I seen of the show where it did devote enough focus on the interactions between Sai and his interest. Beyond that, G Gundam is a mecha anime following your cookie-cutter shounen anime tropes which while not all-out horrible, isn't too original and with much of the show's focus on mecha fights, those wanting more fleshing out with their anime won't be enjoying this series too well. Last updated Saturday, September 25 2010. Created Saturday, September 25 2010.
if you are a die hard gundam - especially the 00 series and wing, you may find this one strange, but just remember, these aren't the gundams you've seen before, this is an alternate universe, so keep that in mind, and if you don't like the gundams, and stay away from robots, well, there's enough drama and humour here, that your interest may be caught! Last updated Thursday, January 20 2005. Created Thursday, January 20 2005. Kidou Butoden G-Gundam Overall, G Gundam is a pretty good show. It's unique and yet, has a more unbelievable line of fighting, but is definently worth watching. Throughout the entire show, Rain and Domon grow a bit closer every day, and by the end of the series, it would make sense that they should be close. It isn't one of those instantanious loves, but one that grows over an entire year for them, with lots of twists and turns along the way, much like real life. Kidou Butoden G-Gundam This is truly a wonderful series. I recomend it to anyone who likes action anime. You have to give it a little while to get started, though. I have seen most of the end, and am right now watching the beginning, and it gets much better towards the end. It starts out with Domone being mean and rather stoney faced, but towards the end, we see he actually is a nice guy, especially towards Rain, the girl he learns to love. If this is anything other than an action based anime with lots of robotics, it is a love story. Much of the beginning is an introduction of the characters. Once that is out of the way and you finally see the Shuffle Aliance (Nah, I'm not telling exactly what that is. You have to see it:-) it is wonderful. It is filled with the question of what exactly is a martial artist? It mostly deals with questions revolving around martial arts and sportsmanship. If you don't like your anime with hidden meaning, you'll like it anyway because of its very nice action sequences (though there ARE better, this stuff IS good--and besides, it's pretty! ).